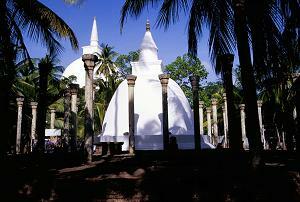 Mihintale is the place where Monk Mahinda and his delegates introduced Buddhism in Sri Lanka by preaching it to King Dewanam Piya Thissa in 236 B.C. This happened on a Full Moon Day which is called Poson Poya. Monk Mahinda explained or "blessed" the "Chulla Hatti Padopama Suthra" to King Dewanam Piya Thissa, afterwards King Thissa himself decided to convert to Buddhism. But before blessing the Suthra, Monk Mahinda did not forget to test the king's intellectuality, because there had been a language understanding problem those days. So monk Mahinda pointed to a Mango tree and he asked the king some questions about it, a kind of ancient IQ test. It is the world's first test of this kind recorded in historical chronicles. Afterwards King Thissa built the temple. So since that day Mihintale has been inhabited by Buddhist monks. At certain times more than 2000 Buddhist monks lived in this area. So it was really a well-organized temple. Today, we can see plenty of ruins from the original temple. During the 8th and 9th century Sri Lanka was attacked several times by merceneries of South Indian dynasties called Pandyas and Cholas. When they invaded Sri Lanka from time to time, they looted the wealthy monasteries. 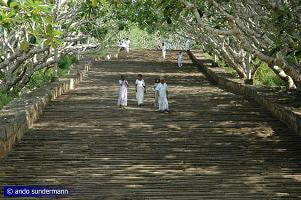 When visiting Sri Lanka you can still see lots of temple buildings used by monks at that time. They were high-quality edifices. 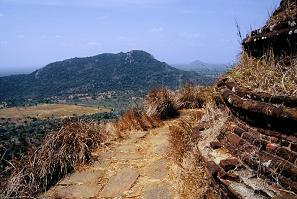 There are several hills in Mihintale on top of which Dagobas were built. Altogether more than 30 ruins can be seen in this area. 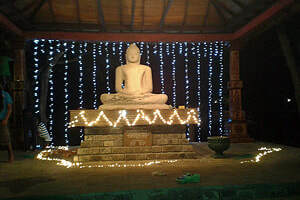 Among the highlights of Mihintale are the ancient hospital, alms hall, so-called Lion pond and Cobra pond, inscriptions, Rajagirilena rock and caves, Ambasthala Dagoba, Mahaseya Dagoba, Invitation rock, a footprint and stone bed in Mahinda's cave, assembly hall, a world-famous staircase, Indikatuseya Daboba and pond. For seeing all these sites you will need at least one full day. There are further very old temples in the village and its surroundings. 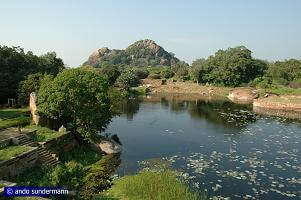 Mihintale had been the hunting ground of the kings of Anuradhapura. 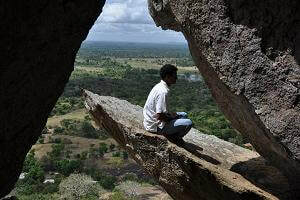 But after conversion to Buddhism the sacred area of Mihintale became a wildlife reserve 2300 years ago. The Sri Lankan chronicles record explicitely, that wild animals had to be protected in Mihintale according to Buddhist teachings. What is the Cultural Triangle? The Cultural Triangle is the area of Sri Lanka which was once the "Rajarata" (Royal Land) of the ancient Sinhalese civilisation, situated in the centre of the island's dryzone, in ancient times it was the most cultivated land due to a complex irrigation system. The corners of this area are Sri Lanka's three most significant former capitals, namely Anuradhapura, Polonnaruwa, and Kandy. Ayubowan means "long life". You can say this word to welcome somebody and you can say this at any time of the day. We can say it in another way, too: "Ayu Bohoowan" is mostly used by the old generation. Likewise, you start the conversation saying "Ayu Bohoowan" to someone very close to you. 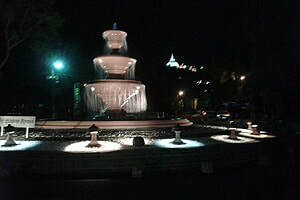 It can also depend on the place of origin in the country. 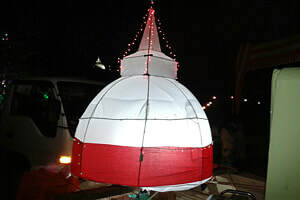 For example, most people from Kandy use "Ayubowan". ... and why to stay a longer period in my "First House Mihintale"? 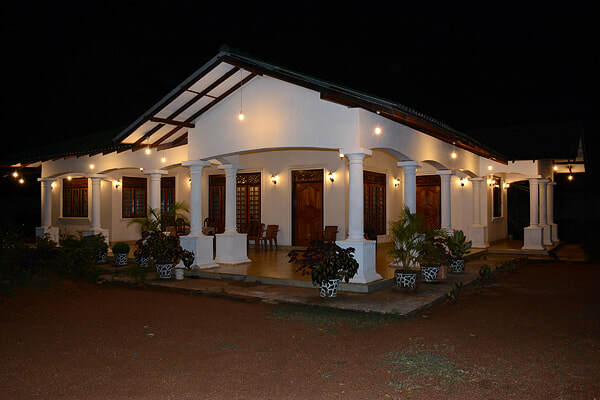 As already mentioned on my homepage, this is a family run guest house. At my place you can really connect to people and experience the local life. While staying with us you can learn to cook Sri Lankan food and cook alone after an introduction or after taking part in a cooking class. So you learn it on the first day and on the 2nd day you can do it for others. My mother will be available to help you, though unfortunately she does not speak English (nor other foreign languages), but as her son, I can assure she will find a way to communicate with you. Occasionally my sister can translate or assist. As my mother likes animals such as dogs and cats, our guests are invited to bring their pets to the guesthouse. We can take care of them. Animals are not allowed to stay inside the guesthouse but will enjoy our large garden, which is warm and safe. It's surrounded by a wall. As long as the gate is closed no animal can leave or enter the compound. You can learn how to dress with a Saree or with Sarongs. My sister can help you to do that. We can also visit a local tailor to make suits or Sri Lankan national dresses. You can wear local style clothing when joining ceremonies or celebrations. For example, I can arrange to join very traditional wedding ceremonies of local families. You can meet our Ayurvedic Doctor at any time, for any kind of information. You can visit his local hospital or he can come to the guest house, too, where you can receive the Ayurvedic treatments you require. But you should know, he is a genuine Sri Lankan doctor visited by our locals, so you can not expect international luxury standards at his place. But the treatment is very professional and he is a kind person. Some persons interested in our culture like to meet monks or to take part in meditation. For authentic meditation classes I can contact a monk from our village temple. You can participate in other Buddhist rituals or programmes, too, you can even study Buddhist teachings with the support of well-educated monastic scholars. 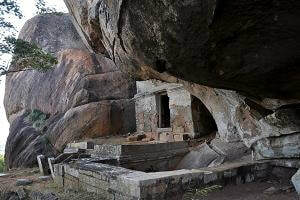 My guest house is located in between the Mihintale rock temple and a very large historical reservoir. So from my guest house you can enjoy a walk through the village to that huge tank, for hiking along the lake or birdwatching, which is also interesting due to the typical dry zone avifauna in our area. There are scenic sunset points at the lake, too. You can also make a bike trip to our historical water tank. With the help of local fishermen, you can catch fish there according to our traditional methods and we can arrange a BBQ party. At the lake you can swim or relax and return easily to the guest house at the end of the day. I hope my proposals and events will enable you to experience the less touristy sides of Sri Lanka and make a difference compared to standard arrangements of international companies. So, dear readers, do you like more activities? I really like to come to know, what are your own ideas and expectations. Your proposals will be an inspiration for me. So please feel free to contact me. 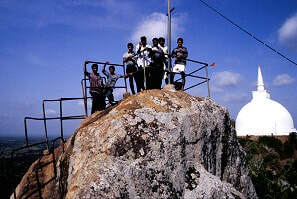 Apart from Adams Peak, Mihintale is one of Sri Lanka's best places to see the sunrise. 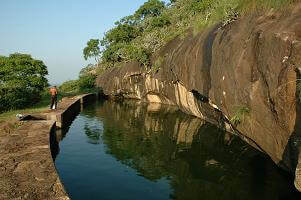 And apart from Sigiriya Rock, Mihintale's Eth Wehera Dagoba is the 2nd best place to see the sunset. Guests really interested in enjoying sunrise and sunset can reach the top within 20 minutes from my guest house. Especially for sunset, I recommend Mihintale, because the sun goes down just behind a big lake (Mahanuwara Wewa) and behind two huge Dagobas (Ruwanweliseya and Jetavanaram) belonging to Sri Lanka's ancient capital Anuradhapura. This sunset is unique to Mihintale and we cannot see in any other part of the world.